﻿ Blood Sugar: Your Key To Vibrant Health | Christiane Northrup, M.D. As you know, I have been counseling women to lay off the sugar for about twenty years now. When I talk about sugar, I am referring to refined sugar, the white stuff. I first started talking about the negative effects of sugar in all it’s forms – bread, potatoes, alcohol, rice and even beans — at a time when most “experts” were blaming fat in our diets for causing obesity and other health problems. Those same experts told you to eat lots of low-fat and non-fat carbs to promote heart health. By now you have probably heard the news—fat is NOT the health culprit we’ve been led to believe. It’s SUGAR! And those same starchy carbs the experts told you to eat can actually be detrimental to your heart, especially if you are a woman. Whether or not you realize it, many of the foods you eat on a regular basis contain a lot of sugar, even the ones that are marketed as “healthy.” A perfect example is yogurt. Some brands contain more sugar than you need for the entire day! That said, all food contains some sugar, and glucose is an important energy source. The key is to understand how the food you eat, and sugar in particular, affects your body, and to know exactly how much you need to be healthy. Carbohydrates (including grains and even fruit) are converted to sugar and dumped into the blood stream. That said, I’ve never heard of anyone overdosing on apples or berries. They are nutrient-dense foods. It is packaged and processed grains and fruits that do the damage. Even a slight increase in fasting blood sugar translates into oxidative damage to the lining of blood vessels throughout the body. And this damage may not show up for years. Today’s diet, which includes excessive amount of these kinds of carbohydrates for many, many people, has led to obesity, diabetes, cancer, Alzheimer’s, and heart disease—epidemics that are affecting the entire planet. Oxidative stress and cellular inflammation from blood sugar that is too high is the final common pathway for all chronic degenerative disease. Controlling your blood sugar is the key to maintaining an anti-inflammatory state. You can do this by consuming high-fiber, unrefined foods at every meal. Be sure to include high-quality protein such as wild fish, organic meats, tempeh, nuts or seeds. Use healthy anti-inflammatory fats, such as olive oil, coconut oil, flax oil, hemp oil, and chia oil. 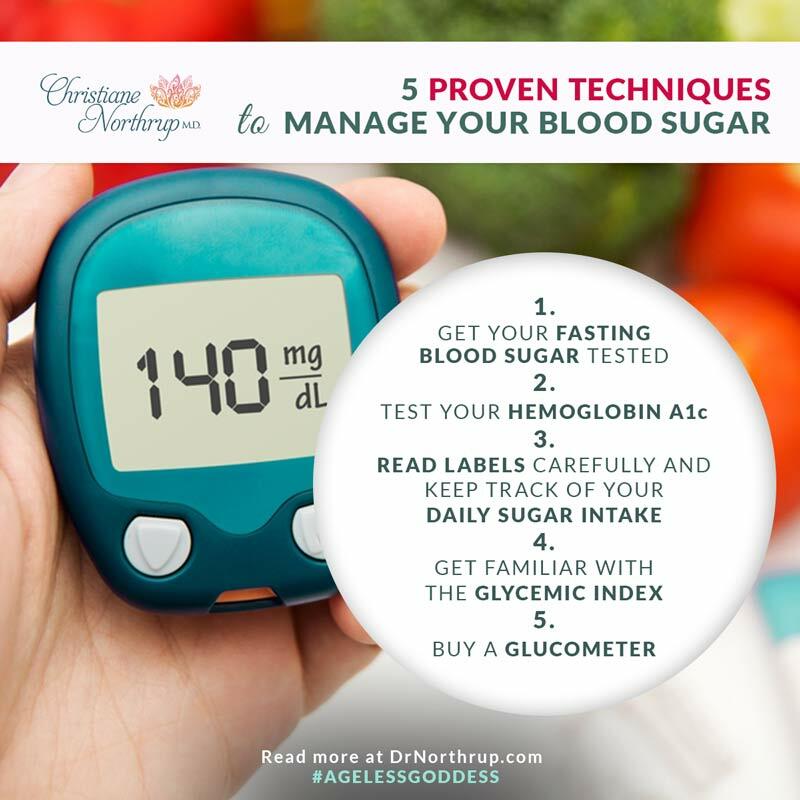 I have information in my books that can help you lower your blood sugar. In addition, I have a lot of information on this website to help you get off the sugar. For example, I offer tips for healthy blood sugar, ways to recover from “sugar addiction”, and even a detailed explanation of how women’s hearts are hurt by sugar so you can dive into the details. Get your fasting blood sugar tested. Ideal blood sugar levels are between 85 to 90mg/dl. Anything higher than that is too high despite what your doctor says. Test your hemoglobin A1c . Your A1c determines how well your blood sugar has been controlled over a 6-12 week period. Normal is between 4-5.6%. Read labels carefully and keep track of your daily sugar intake. When reading labels, the easy thing to remember is, if has an “ose” on the end, it’s sugar: Glucose, fructose, sucrose, and even lactose are all sugars. Get familiar with the glycemic index. Know the Glycemic Index for the foods you regularly eat and try to stay with foods that are in the low to moderate range. For more information about Glycemic Index, I suggest that you read The Belly Fat Cure by Jorge Cruise and Healthy for Life by Ray Strand, M.D. Buy a glucometer. 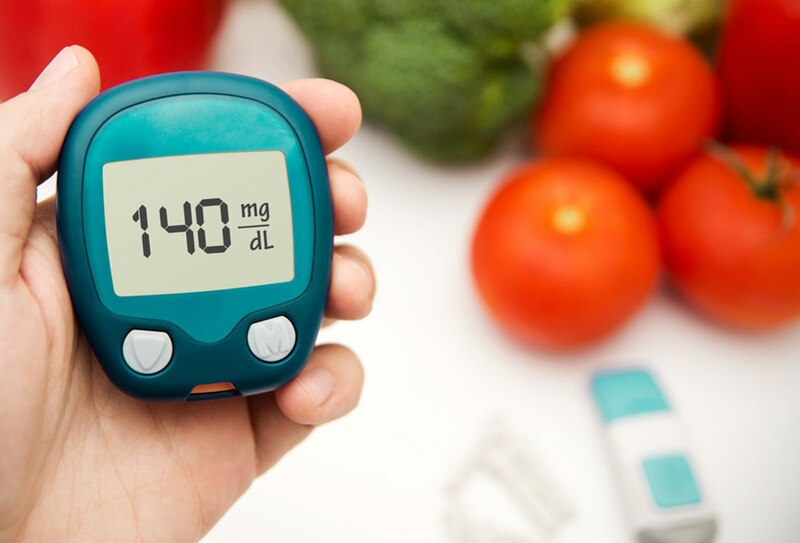 Even if you don’t have diabetes, you can use a glucometer to see what foods, activities, and stressors cause your blood sugar to shoot up. Think of it as a biofeedback device. How have you changed your diet? And how has it affected your health? Have you ever used a glucometer, and if so what was your experience with it? I’d love to hear how you were able to lower your blood sugar to a normal range. As a woman with a ‘sweet tooth’, I’ve found being AWARE of what excess sugar does to my body has been the best way to change my taste in food. I still enjoy sweets, but have found so many other foods to be satisfying, that cutting back is not a burden. Thanks for giving permission to share this. I’m launching a site, BecauseWomenCare, specifically for women in our 50 and 60’s. I have an article about busting the chains of sugar addiction and included is a link to this video. Hi, about nine years ago I suffered from severe acute pancreatitis, idiopathic (I do not drink and there were no gallstones). I was very sick, hospitalized for 16 days and had no food by mouth for two months. I received insulin for the first few weeks as my blood sugar was high due to the damage to the pancreas. I developed a pseudo cyst that required an operation six months later. I had damage to my intestine, kidneys, lungs, liver…. I feel great these days, gym six days a week includes yoga, weights and cardio. I also walk daily and always get a minimum of 10,000 steps. I also have Hashimoto’s disease. Now, nine years later my blood sugar is still at the high end of normal(we measure in different units in Canada) no matter what I do. I am gluten free (allergic), grain free and eat little or no sugar. My triglycerides are good. What else can I be doing? Is the pancreatic damage to blame? I finally brought my blood sugar under control by eliminating sugar, all fruit, all grains, and making sure I ate healthy fat with my complex carbs. I loaded my veges and organic meat, fish, with butter, real olive oil etc. If I cannot drink milk or even eat rice! I get organic raw milk and drink the cream (legal in my state). Finally off all meds (for 5 years). I’m 63,a breast cancer survivor of 3 years and don’t have high fasting blood sugar levels but my A1c is typically 5.7. I’m aware of how much sugar, carbs I eat but not always diligent to reduce them. I’m fairly thin and exercise or walk consistently so I am lean and have muscle. Since muscle burns glucose it help me keep my weight down. I also take natural supplements to help with my blood sugar. I will ask my endocrinologist (who monitors my thyroid nodules) about a good glucometer and which readings I should be concerned about. My blood sugars are up and down. Readings range from 200 to 400….Dr prescribed Fibrate drugs….any opinions or experience with this drug? Triglyceride levels are directly affected by sugar intake. Best to use a dietary approach first and foremost. All meds have so-called “side effects”. But as Bruce Lipton, PhD points out, these are not “side effects.” They are “effects.” Thanks for sharing. I find Spelt grain a great substitute filler instead of rice/potatoes/etc; is Spelt OK ? In general it is! It’s one of those “ancient grains” that Big Ag and Big Chemical hasn’t started messing with yet. Better than conventional wheat. I love my doctor. He noted my weight was ‘creeping up’ which prompted me to make some changes. My fasting glucose level was high nineties. I lowed it ten to fifteen points to the 70’s and 80’s by eliminating virtually all bread, pasta, potatoes, sweets, all refined carbs. I increased my daily exercise two fold (two brisk twenty minute walks at 3 miles per hour or more, instead of one) and added moderate weight lifting (two five pound weights and three sets of upper body lifts, twenty times each set). I use flax oil and fish oil supplements and chia seeds for Omega 3. Beans, Grains, Vegetables and fruit will all help you get your A1C down. It is a vegan diet. No sugar or salt. When I eat this way, my FBS is great. Animal protein is not good for your kidneys. Eat it sparingly. Check out Forks Over Knives. We follow a vegan, oil free diet. I do eat legumes, greens (lots) veggies, some fruit-particularly berries– and other fruits and veggies. I wonder what Dr. Northrup feels about Dr. Esselstyn’s program. I also have a great deal of trouble eating animals now–particularly because I am so opposed to factory farms. Despite going completely off sugar and gluten my FBS, as tested by my own glucometer, has never tested below the 90s. Where do I go from here? How do we know our glucometers are accurate? I’ve read that the accuracy can vary by a great deal and regulators don’t require less than 20 point accuracy: if that’s the case, glucometer readings are pretty meaningless. Please comment. When in doubt, get a glucose tolerance test ordered. And also a fasting insulin level. Levels aren’t meaningless, they are simply a way to steer the ship of your health in the right direction. Hypoglycemia is often a precursor to sugar problems in general. I suggest you start eating far more healthy fats and good protein. Your numbers indicate a sugar problem! Great info. How about those of us that have trouble keeping the blood sugar levels high enough? I have reactive hypoglycemia (idiopathic) while eating “clean” and frequently. You mentioned the effects of chronic high levels on the human body; what about chronic low levels? Too high or too low– two sides of the same coin. Eat more healthy fats and protein. Think raw nuts, nut butters, hard boiled eggs. Celery , carrot sticks. Snack every 2-3 hours. Don’t skip any meals!! Aloha! I’ve changed my diet by eliminating BREAD, PASTA, and as much wheat and carbs as possible. I read, “Wheat Belly” and referred to the “Wheat Belly Cookbook”, both by Dr. William Davis. I lost my (pregnant looking) belly and have gone from a size 10 to a size 8. Reading labels and trying to eat “single ingredient” foods is also helpful. These things and using alternate sugar like Stevia has most likely contributed to my weight loss and even curbed my appetite because apparently consumption of today’s wheat and refined sugars contributes to an addiction to eating more and more of the bad ‘stuff’! Not to mention what Dr. Northrup has explained in the video about the ways to develop dreaded diseases. I’m so glad to see Dr. Northrup, of whom I am a HUGE fan for many years now, talking about carbs. and sugars as we Americans so know them. Thank you, Dr. N, for ALL YOU DO!!!! Thank you for such a GREAT COMMENT!! And BRAVO to YOU!! Thank you for all your helpful tips. Thank you, thank you, thank you! I have a glucometer and am cutting out grains and the obvious offender, my after meal readings are great, yet my fasting morning blood sugar is high-high nineties and sometimes even above 100. Do you have any tips? Good video, I use a glucometer already. My problems is reactive hypoglycemia. It is hard to find support and information for it. My daughter has diabetes Type 1. Carbs are part of her daily routine to help maintain a balance in her sugar levels. Is there a healthier way? Thank you and thank you for all your interesting and educational videos and articles. As Dr. Northrup noted, carbs are an important part of everyone’s daily diet and an important source of energy. As long as she is mainly eating unprocessed, unrefined foods, most diabetics who are careful with their diets have far healthier diets than most Americans. Snack suggestions: raw nuts. Raw cheese ( Whole Foods has this in many places). Celery with peanut or almond butter. I sometimes use QUEST bars when traveling. You can get them on Amazon. Lots of protein. Very low in sugar. I need to get a glumeter because I do not understand how the foods I eat effect me. I am vegetarian and eat lots of fruit and vegetables but I am 53 and over weight. I think it is what I am eating that makes me overweight. Too big a portion and too frequent snacking. what is the healthy range reading on a glucometer for normal blood sugar? As Dr. Northrup noted, fasting blood sugar should ideally be between 85-90. In the video (at 1:40) the fasting blood sugar ideally, should be 70 – 90 mg/dl, not 85 – 90. My doctor gave me a glucometer for educational purposes and it has been a tremendously helpful tool in understanding which foods affect the level of my blood sugar. Didn’t realize how certain things I was eating were making my blood sugar rise and causing me to feel bad. Using this tool I have been been able to change my diet to keep my blood sugar in a healthy range and I feel so much better! Just what I needed to hear again! For 6 years honoured my body through very high stress points, but have fallen off the deepend due to the carbs, this motivates me to get back to it! I’m just turning 49 this year, have had a lot of stress due to my youngest who’s 16 now, who has a severe seizure disorder since 6 months old, divorce, my other son type 1 diabetes, 2 deaths in family 8 weeks apart, & now civil court with my passed brothers wife over the family farm. I am very a very gifted person intuitively also. I can get stuck in my life & not live in expansion. I tend to abuse my body with carbs. This gave me the awareness to step back into this for my well being. Given my dad was type 1 diabetic for 55 years before he passed, these were th 2 deaths in the family, I need to stay on top of this for me! The gifts that I received with all of this was learning how may gifts I do have that I need to step into in life. This video is the start to getting myself back again on the path I need to be on! Thanks Christine!!! Very grateful for your work over the years. I find a blessing everyday in life no matter what I go through & you are it today!!! Great article! I’ve been waiting until our move to another state was completed before I began looking into my blood sugar issues. I’ve had low blood sugar sine my 20’s & now in my 60’s. It’s gotten really bad- shaking & severe irritability, weight gain. I need to work on finding a good Dr. In McCall Idaho that I can work with & get my health insurance set up over here. Morning/ breakfast is the worst! Want to just throw something in my mouth until I can get some “real food” in me later! Help!!! Is there a Glucometer you can recommend that doesn’t involve a finger prick?! I understand the glucometer can give you an idea of what you eat that spikes up sugar. What foods are appropriate to eat to keep sugar level low? I have eliminated all “sugar” from my diet (any added sugar grains) and have severely limited my intake of pasta, but I am unable to eliminate the fruits, beans and nuts, as I have also eliminated red meat. I use nuts, beans and fish as my protein. And I need to get my A1C checked, as I have never had that reading taken. My fasting blood sugar is in the low 100 range… and I do not feel that I am “feeling” any better from this regime, but will continue. I think eliminating beans and nuts might work..I have just started it.. I am a part of GREY SHEET group that has the food plan like this.. I have less food cravings when I do not eat beans and nuts. May be the affirmations about having more sweetness in life works as well.. and paying attention to what is sweet in our lives. Thank you for always making it easy to understand what we need to learn. The way you communicate is clear cut, interesting and is always on important topics. Love you!! how do I lower my A1C – my range is 5.9-6. I am vegetarian – no egg, fish, meat and I don’t eat any junk food or few times in restaurant. any particular food do I eat to lower this A1C. I walk 45 min. daily and twice work with weight exercise in the gym.